Near-field optical images of various gold nanostructures. A: Single gold nanorod (length 540 nm). The amplitude of the wave function is visualized. B: Dimers of spherical gold nanoparticles (diameter 100 nm). Strong optical fields are observed in the interstitial sites. C: Island-like assembly of gold nanospheres (diameter 100 nm). Strong field is localized in the rim part. D: Chirality image of gold nanorectangle observed with circularly polarized light. Yellow and blue parts indicate opposite handedness of chirality. Although a rectangle is not chiral, strong local chirality is visualized in this image. 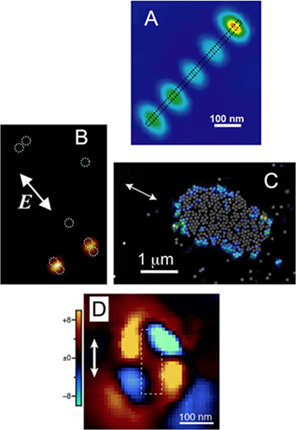 H. Okamoto, T. Narushima, Y. Nishiyama, and K. Imura, "Local Optical Responses of Plasmon Resonances Visualised by Near-Field Optical Imaging," Phys. Chem. Chem. Phys. 17, 6192-6206 (2015). S. Hashiyada, T. Narushima, and H. Okamoto, “Imaging Chirality of Optical Fields near Achiral Metal nanostructures Excited with Linearly Polarized Light,” ACS Photon. 5, 1486-1492 (2018). K. Imura, K. Ueno, H. Misawa, and H. Okamoto, “Anomalous Light Transmission from Plasmonic Capped Nano-Apertures,” Nano Lett. 11, 960-965 (2011).